SunTek Carbon Window Film feature a proprietary construction that utilizes unique carbon technology, non-reflective "black" finish thatwill not fade", great solar performance with advanced UV protection. Call us for a quote! 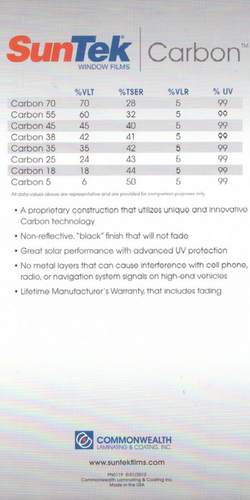 Get more information on SunTek's carbon tints here!